I was back in one of my favorite places today. At our game table next to the living room window. 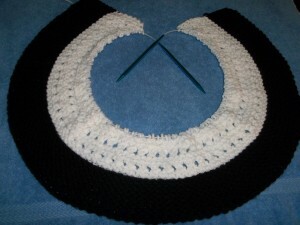 I am learning to make a Mobius Cowl scarf. I hadn’t felt like working on it lately, but today I was right back at it.This type of scarf is knit on a circular knitting needle. 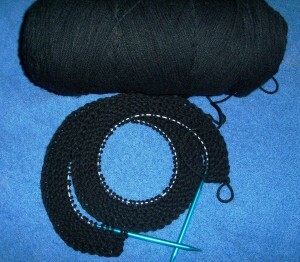 I will continue to knit in the round until the scarf reaches the desired size. I’ll be sure to post a photo when it is finished.Please stay tuned. While on vacation last weekend, I knit a new dishcloth for the trailer. I used to knit a lot, but have gotten away from it recently. I’d forgotten how nice it is to just sit and knit. I’ve often heard that knitting is good for the brain and I wondered why, so I went on line to find out. 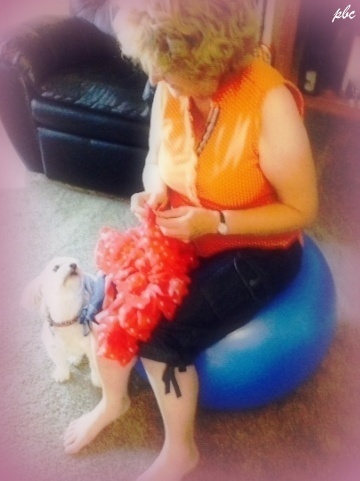 While knitting you are focused on the moment and not thinking of problems, or things that might be stressing you. Knitting puts you in a meditative like state, which decreases your heart rate and blood pressure. When knitting you are concentrating on a pattern and often learning new stitches which is a great exercise for the brain. It is also a wonderful way to exercise your hands and keep fingers limber and flexible. 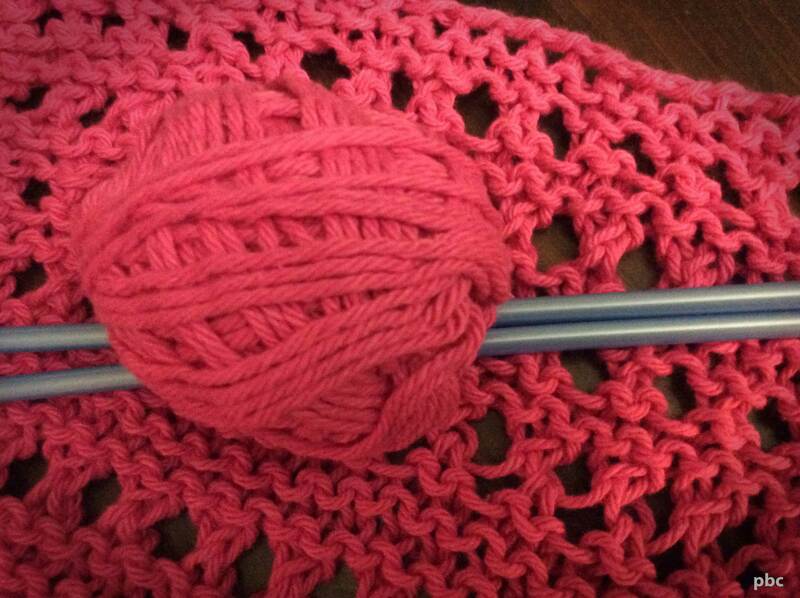 Being part of a knitting group always made me feel good because I was creating something for someone else. Last July I wrote a post,The Completion of a Knitted Blanket, where I first showed the above blanket and told about the knitting group I belonged to. I’ve taken a break from knitting, but as I write this I find myself getting excited and looking forward to getting back to this very beneficial hobby. It is time for me to make time to pick up my needles and yarn. For the good of your own health, you might like to do the same. For those who don’t have access to a knitting class or know someone who can teach you, You Tube has many videos on learning how to knit and crochet, which are both equally good for you. Go ahead and give it a try. Learning something new is always a wonderful thing to do. While knitting a baby blanket using a lavender, pink, and blue variegated yarn, I suddenly remembered back to a year ago, when our neighbor was having her first baby. On her registry was a request for a black and white baby toy. That is when I learned that babies see black and white before they begin to see colors. 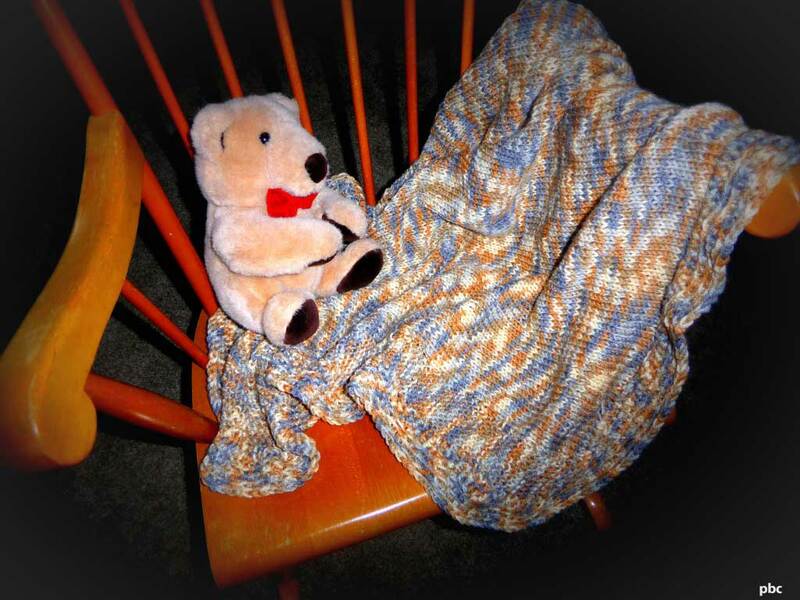 I, like most knitters, have been creating baby blankets from pale pastel shades. 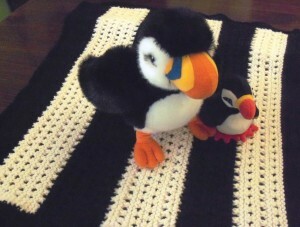 The idea of a black and white baby blanket intrigued me. I quickly looked through my stash of yarn, but no black, and certainly not enough white. 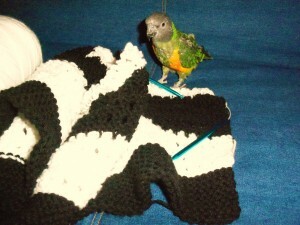 I could not get the black and white blanket out of my head, even though my current project was only half finished. Before I knew it, I was on my way to my favorite craft store to buy the needed yarn. I also purchased a new set of circular needles. I prefer to knit with circular needles, finding them more comfortable to work with and less likely to slide from the stitches. Shortly after returning home with my purchase, I cast on 111 stitches using the black yarn. I liked the idea of a black border for the blanket. Next it was time to change over to white and begin a new pattern. I liked the look of the black and white combination. I was not sure if I should have changed the pattern, but I wanted to keep going before I made my decision. Our Senegal parrot, Cossette is inspecting my work. She wasn’t sure she liked black and white at first, but seemed ok with it as her curiosity got the better of her. Several weeks have passed, and the blanket is finished. I tend to be a slow knitter and friends tell me I should learn to crochet, because it is faster. I will have to think about that. I like the contrast of the black and white, but it does not seem quite right for a new born. I have a feeling that I’ll be going back to my pastel shades. In case you are wondering, Cossette was asleep for the night when I took this photo, so I had to find some stand ins.